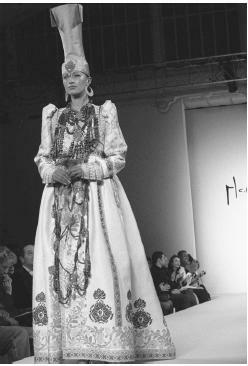 Mary McFadden, fall/winter 1999 collection: Mongolian wedding gown with beading and embroidery. (divorced); children: Justine. Career: Director of Public Relations, Dior New York, 1962-64; merchandising editor, Vogue, South Africa, 1964-65; travel and political columnist, Rand Daily Mail, South Africa, 1965-68; founder, Vukutu sculpture workshop, Rhodesia, 1968-70; also freelance editor for My Fair Lady, Cape Town, and Vogue, Paris, 1968-70; special projects editor, American Vogue, New York, 1970; freelance fashion and jewelry designer, New York, from 1973; Marii pleated fabric patented, 1975; president, Mary McFadden Inc., from 1976; home furnishings line introduced, 1978; lower priced line manufactured by Jack Mulqueen, from 1980; Mary McFadden Knitwear Company, launched 1981; also costume designer for Zooni, 1993; launched Mary McFadden Studio, 1995; began designing neckwear, 1999; Mary McFadden Collection, debuted 2001. Exhibitions: A Passion for Fashion: The Mortimer Collection, Wadsworth Atheneum, Hartford, Connecticut, 1993. Awards: Coty American Fashion Critics award, 1976, 1978, 1979; Audemars Piquet Fashion award, 1976; Rex award, 1977; Moore College of Art award, Philadelphia, 1977; Pennsylvania Governor's award, 1977; Roscoe award, 1978; Presidential Fellows award, Rhode Island School of Design, 1979; Neiman Marcus award, 1979; Doctor of Fine Arts, Miami International Fine Arts College, 1984; American Printed Fabrics Council Tommy award, 1991. Address: 240 West 35th St., New York, NY 10001, U.S.A.
Morris, Bernadine, and Barbara Walz, The Fashion Makers, NewYork, 1978. Milbank, Caroline Rennolds, Couture: The Great Designers, NewYork, 1985. Diamonstein, Barbaralee, Fashion: The Inside Story, New York,1985. Tucker, Priscilla, "Mary Had a Little Dress," in the New York Daily News, 6 April 1980. Foley, Bridget, "Mary McFadden: A New Type of Tycoon," in New York Apparel News, March 1983. Rafferty, Diane, "Beyond Fashion," in Connoisseur (New York),October 1988. Thurman, Judith, "Power Gives You an Aura, Says Mary McFadden," in Mirabella, September 1989. Gross, Michael, "Mary, Mary, Quite Contrary: The Life and Loves of Mary McFadden," in New York, 26 March 1990. "The Designers Talk Passion, Whimsy and Picassos," in ARTnews (New York), September 1990. Horyn, Cathy, "A Mary-Tale Romance," in the Washington Post, 9June 1991. "New York: Mary McFadden," in WWD, 4 November 1994. 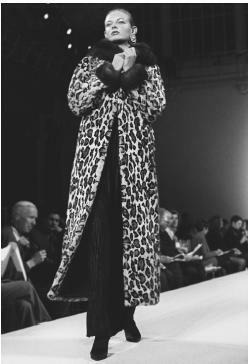 Mary McFadden, fall/winter 1999 collection: sheared mink coat with a stenciled leopard print. Friedman, Arthur, "McFadden Exits Seventh on Sixth…," in WWD, 21 March 1995. "MMCF's New Society," in WWD, 25 July 1995. "Mary McFadden Launches Better Special-Occasion Line," in WWD, 19 September 1995. Monget, Karyn, "McFadden, Boutique Industries Renew Licensing Agreement," in WWD, 20 October 1997. McKinney, Melonee, "Women's Designer Mary McFadden to DoFirst-Ever Neckwear Collection," in WWD, 19 March 1999. "Joan Blumberger Olden Rejoins Mary McFadden," in WWD, 11August 2000. Greenberg, Julee, "McFadden Expanding," in WWD, 5 September 2001. With an artist's sensitivity to color, harmony, and proportion, Mary McFadden successfully designed original clothing for nearly 20 years. Her distinctive garments reflect an avid study of ancient and ethnic cultures. Inspired by the art and artifacts of Greece, Byzantium, South America and China, among others, as well as the distant cultures encountered during her own travels around the world, McFadden built a foundation of pure, timeless silhouettes to which she added exotic details, decorations, in stunning fabrics, to culminate in elegant and flattering results. When Vogue featured McFadden's simple tunics made of African prints and Oriental silks, clothes she had fashioned for herself out of necessity during her years spent in South Africa, the effect created sensation. While trousers had become accepted as daytime workwear during the 1970s, women were resigned to spongy polyester double-knits in mundane sherbet colors. McFadden's tunics, worn over silk Chinese pants, offered the comfort of natural fabrics and the eye appeal of vibrant colors and patterns. McFadden's first collection included quilted kimono-shaped jackets, flowing silk or chiffon trousers topped by loose togas made of stylized batik prints depicting Indonesian flowers and dragons, themes she was to repeat in a more luxurious manner in the fall of 1992. Bold, chunky, African-inspired jewelry made from various metals, plastic, and coral accented the eclectic mix. Shimmering tunics resembling the shapes and patterns of butterfly wings followed, as McFadden developed her famous " Marii " pleating, recalling Fortuny's silk pleated fabrics, which were, in turn, based upon ancient Greek and Egyptian pleating. McFadden's pleated evening gowns were ideal for her wealthy, jet-setting clientéle since they were made of satin-backed polyester, which retained the pleats through hand-washing and travel. McFadden's awareness of modern technology had succeeded in making the pleats permanent. Even her less expensive clothes, offered in the late 1970s, maintained an exotic feeling through the use of hand-painting on challis and suede, macramé yokes, quilting, and grosgrain ribbon binding. Herself a striking model for her creations, McFadden presented some black and white outfits in every collection, echoing her own straight black hair and very pale skin. Drama was created by the contrast, texture, and richness of fabric. The same sense of sophistication was imbued into McFadden's bedding and table linen licensing. During the late 1970s her more expensive line of dresses included chiffon embroidered in gold, silver, and gold lamé, gold washed silks, foreshadowing the opulence of the 1980s. McFadden continued to design bold sculptured jewelry and braided belts to tie her gowns closer to the body or to use as edgings. Bolero jackets featured details from Portuguese tiles, an example of McFadden's ability to focus on a detail of a work of art, enlarge the motif, and incorporate it into her design. Ever sensitive to the interplay of textures, the designer punctuated her columns of fine vertical pleating with beaded cuffs and collars, jewel encrusted panels, draped diagonals. Many of her garments came close to the surface richness of the art-to-wear movement but, eschewing the social statements inherent in the movement, her work was instead wearable art, to be collected and taken out to wear as one might precious jewelry. As evocative of the past as some of McFadden's designs may be, they stop short of looking like costumes. Pattern-upon-pattern mosaics of gold embroidery on sheer silk may highlight a Gustav Klimt-inspired collection, but the clothes have always been modern. Despite the vagaries of fashion, McFadden maintained a consistent aesthetic. Her clothes offered something for almost everyone who could afford them. McFadden herself recommended, "chiffons for the heavy figures, the pleats for the thin ones, the velvets for everyone." By the end of the 1980s, McFadden had experimented with showing slits of bare skin in between swaths of pleated strips composing the bodices of her gowns. The columns closely outlined the curves of fit figures, for the cult of the body was in full swing. The designer shortened her skirts to above the knees, flippy skirts of rows of layered pleats dancing beneath sequined tops. A striking short dress in the spring of 1992 had a skirt encrusted with beads forming a panel from a Tiffany wisteria window, belted with a beaded belt beneath a diagonally Marii-pleated sleeveless bodice. Her Japanese collection followed, the mystery of the Orient conveyed through embroidered snakes and sinuous blossoms. In 1995 McFadden shifted her secondary line from daywear to more occasion dressing and dresses wearable for day and evening, then created two new lines: the value-priced Mary McFadden Studio, featuring classic dresses and eveningwear, and Mary McFadden Collection, consisting of better suits and sportswear for younger women, which debuted in 2001. Additionally, McFadden, like other designers, had also become a popular guest on QVC. The McFadden accessories featured on the television shopping channel sold exceedingly well. It may well be said of Mary McFadden that "she walks in beauty," especially since she wears her own designs. She has proven, however, that she is far more than a pretty face. As a preeminent designer she has used her unique skills to fashion an empire, supporting various charities, and overseeing numerous licenses for womenswear, sleepwear, footwear, eyewear, neckwear, and home furnishings. I would love to see a Mary Mcfadden fashion show on the computer.I know I will never see one in person.I have been in love with her beautiful gowns for as long as I can remember.